Why Horace? William Anderson in his introduction offers compelling reasons, echoed by the interpretative essays chosen for this volume. Horace brings a maturity and artistry to his subjects not found elsewhere in Roman poetry. The son of a former slave, Horace brings a new voice to the poetry of his time. In Horace's hands, poetic tropes and standard topics take a new turn: his musings on love and interpretations of the carpe diem theme amuse and amaze readers who thought they'd heard the last word on these subjects. Furthermore, the number of meters Horace used and perfected surpasses those of his poetic predecessors; words in his poems are masterfully placed in mosaic-like, intricate patterns. Horace is an innovator on the subject of the poet and his lyric vocation. Whether he is being crowned by the Muse, escaping death in battle through the intervention of Mercury, slipping the clutches of an ambitious bore with the help of Apollo, or miraculously turning away a monstrous wolf by singing love poetry, Horace challenges his readers to ponder the place of the poet in our world. Horace lived during a period of momentous change in Rome. He wrote about Augustus and reflected on the political scene in Rome and the Empire in every book of his poetry. This scene not only serves as the backdrop for the poems, but also informs and expands the poems' meanings even as they reflect an intimate picture of these tumultuous times. 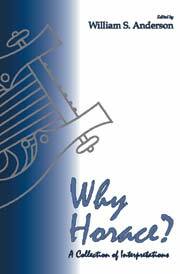 William Anderson's Why Horace? addresses the Advanced Placement Latin student who may have voiced the complaint of the title "Why do I (or we) have to read Horace of all people?" (v). The book's focus is Horace the lyric poet; with the exception of Anderson's essay on Satire 1.9, the various articles treat poems from Odes 1-3 exclusively, in keeping with the book's AP audience. Why Horace? comprises 21 articles: 11 on Odes 1, four articles each on Odes 2 and 3, one on Odes 4.7 and one on Satire 1.9. Each article is preceded by the editor's introductory note; sometimes he adds a note of disagreement with the article. Anderson authored four of the articles, including the only one first appearing in this volume. The remaining articles, written by well-known Horatian scholars, range in publication dates from the 1950s (one), 60s (four), 70s (five), and 80s (ten), none from the past decade. Although some of the articles may be tough going for high-school students, Anderson's compilation will be a useful addition to the AP class. The book provides a good introduction to scholarly discussions on Horace's work an a point of departure for class discussion.